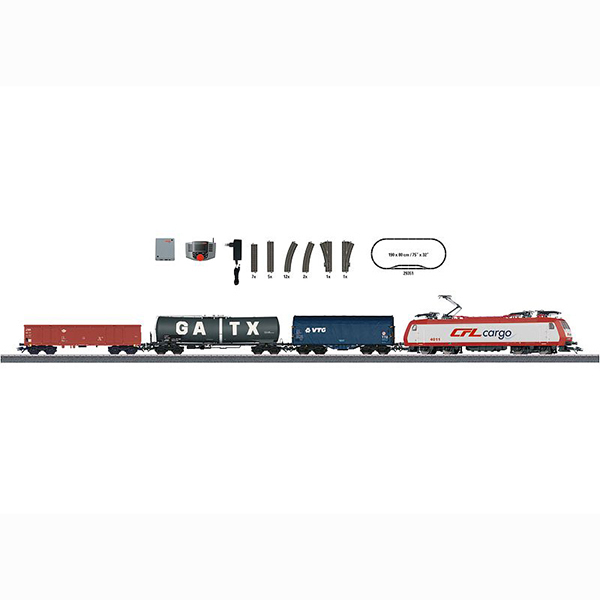 Model: The locomotive is constructed of metal and has an mfx digital decoder and a special motor. 4 axles powered by means of cardan shafts. Traction tires. The triple headlights change over with the direction of travel, will work in conventional operation, and can be controlled digitally. Warm white LEDs are used for the lighting. The locomotive has 4 pantographs that can be raised and lowered. The sliding tarp car has a closed tarp and type Y25 welded trucks. The tank car has a partially open frame. All of the cars have close couplers with guide mechanisms. Train length 69.6 cm / 27-3/8". Contents: 12 no. 24130 curved track, 5 no. 24188 straight track, 7 no. 24172 straight track, 2 no. 24224 curved track, and 1 pair of no. 24611 and 24612 turnouts. The set includes a track connector box, a 36 VA switched mode power pack, and a Mobile Station. An illustrated instruction book with many tips and ideas is also included. This set can be expanded with the C Track extension program and with the entire C Track program.